Equality Illinois is a member of the Responsible Budget Coalition and urges the state legislature to adopt a spending and revenue plan that protects vital services for Illinois workers, families, children, seniors, immigrants, and other residents in fiscal year 2016. Equality Illinois strongly opposes the proposed Fiscal Year 2016 cuts to programs that provide relief and opportunity to many Illinoisans. We must fight against poverty, ensure access to health care and housing, and cultivate an environment where every person is safe and secure in their school, workplace, and neighborhood. The budget must demonstrate these priorities. 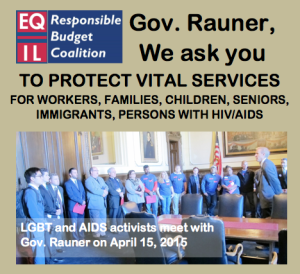 As a member of the Responsible Budget Coalition, Equality Illinois, the state’s oldest and largest advocacy organization for LGBT Illinoisans is teaming up with a large and diverse coalition of 150 organizations united to preserve vital services for Illinoisans. The Coalition focuses on three common principles: ensure adequate revenue to support state priorities and make smart investments, make no more cuts to services, and establish fairness in revenue sharing and cuts caused by failure to raise adequate revenue. Equality Illinois outlined several of the dramatic cuts it opposes in Gov. Bruce Rauner’s proposed Fiscal Year 2016 budget. HIV/AIDS: Funding for HIV/AIDS services are reduced by 25%, and the African-American HIV/AIDS Response Fund is cut by 66%. These cuts, which translate into more than 7,000 less HIV tests administered in the next fiscal year, are especially troubling because 50% of all new HIV cases occur within the African-American community. For every new case of HIV prevented, the state saves $435,000 per person in lifetime medical care and treatment costs. Medicaid: The proposed budget slashes the Medicaid program by $1.47 billion, including elimination of programs for renal dialysis, adult dental services, and podiatry services. The plan also ends Medicaid eligibility for the hemophilia program and Illinois Breast and Cervical Cancer Program, which ensures that low-income uninsured women and transgender people have access to HPV testing, breast and chest health screenings, and Pap smears. These massive cuts to the Medicaid program directly impact the health of HIV+ people, transgender people, and women. For these individuals, early detection of infection and cancer can mean the difference between life and death. Homelessness and Stable Housing: Forty percent of homeless youth identify as LGBT. Many of these youths leave or are thrown out of their homes when they come out of the closet. It is deeply harmful to them then that the proposed budget would deny more than 1,300 homeless youth access to shelters and other services. Also, more than 10,000 recently homeless households would lose access to supportive housing services while almost 1,000 at-risk households would be prevented from accessing assistance that could keep them in their homes. Mental Health: The proposed budget cuts or eliminates funding for mental health services, including funds for psychiatry and care coordinators who assist people with mental illness in finding appropriate care. Mental health services are especially important to LGBT youth, who suffer higher rates of depression, suicide attempts, and substance abuse because of rejection, social stigmatization, and harmful conversion therapy. Anti-bullying: Funding is eliminated for programs that prevent school bullying despite adoption last year of major legislation requiring school officials to create and implement specific anti-bullying policies.